Suckering deciduous shrub or small, spreading tree. 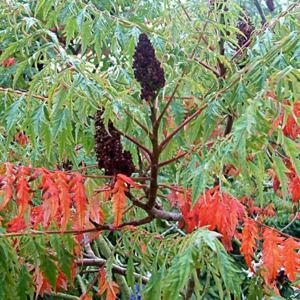 Smooth shoots and large pinnate leaves with up to 13 oblong to lance-shaped, green leaflets which turn fiery orange and red-purple in autumn. Erect, dense, conical panicles of yellow-green flowers followed by bristly dark red fruit. Moist, well drained soil in sun or part shade. Autumn colour is best in sun. Suckers may become invasive.